Google listened to all the feedback from the last few Nexus generations and produced two of the best Nexus phones ever. Remember how underwhelming the Nexus 6 and Nexus 9 turned out to be? This year will be entirely different. The Nexus 6P and Nexus 5X are both evidence that Google’s back on the path to greatness. The Android maker hooked up with LG again and invited Huawei into the fold, each vendor throwing their own stock Android phone into the ring. Both phones boast 64-bit processor performance and an improved 12.3-megapixel camera sensor with low-light abilities. Two new handset designs prove that Android's modern candy-bar smartphone aesthetic isn’t going anywhere anytime soon. Google said it partnered up with LG again because the Nexus 5 was one of its best selling phones. 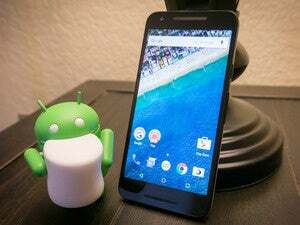 I wouldn’t be surprised if the Nexus 5X ended up selling just as well. The black LG Nexus 5X is a bit of a fingerprint magnet. The camera lens protrusion on the 5X is a little annoying. That circle on the back is its fingerprint sensor. The Nexus 5X is exceptionally light—about 136 grams, according to Google. While I appreciate that it's light as feather, it makes the phone feel like one of LG’s mid-range devices. I doubt it will be a bother to anyone—because who doesn’t want a lighter phone?—but compared to the Nexus 6P, it feels sort of cheap. The phone is also completely plastic, so while you might not feel too bad about dropping it, it’s hardly a premium flagship like what Samsung and HTC put out earlier this year. The Nexus 5X in white. That’s what Google is going for with the Nexus 5X, though: a phone that isn’t overly pretentious, but works really damn well. Because it’s running stock Android, the Nexus 5X is speedy and responsive. It comes with all the same trimmings as most stock Android devices, too, like Google’s suites of apps. Beyond that, it’s really up to you to install the apps you like, which fits in perfectly with Google’s philosophy. Carriers, please take note. This is Google's version of a premium flagship. The Nexus 6P is a serious breath of fresh air after last year’s less-than-stellar Nexus 6. It feels more premium than its cheaper counterpart, the Nexus 5X, though it also feels similar to the Huawei Mate S I handled in Berlin earlier this month. That protruding camera sensor on the back isn’t so bad, by the way—I know we were clamoring about it after the press renders leaked out, but the lens protrusion is actually a bit worse on the Nexus 5X. It's so thin and dense! The Nexus 6P's gorgeous metal corners. The Nexus 6P is made of aluminum. It’s light enough for your pocket, but dense enough to throw at someone’s head and possibly inflict some harm. That’s how solid the 6P feels in the hand. Its beveled metal edges are pretty sweet, too, and although I’d hardly pit this device in a design contest against the Galaxy S6—or even the iPhone 6S—it’s nice to see Google offering a more premium product in its Nexus lineup. Admittedly, I only had a few minutes to snap photos here and there at the event, but that's all I needed to be convinced that Google took all the criticism of the camera quality in its Nexus lineup to heart. The Nexus 6P took a surprisingly clear photo of Android Police's David Ruddock. To recap, the Nexus 5X and 6P each feature a rear-facing, 12.3-megapixel camera sensor with a maximum aperture of f/2.0. I didn’t expect either of the Nexus phones to produce a photo that was clear in the lighting that we were in. Most smartphones struggle when there are recessed spotlights overhead, but the 6P performed just fine from the preview I saw on screen. I did notice that the shutter speed was just a tad slower on the 5X than the 6P, though I couldn’t pinpoint the issue. I managed to play around with the refocus feature on the Nexus 6P. It was a little weird to use at first, but I liked the effect. Also, I’m still not a fan of the stock Android camera application: it’s way too barebones for me, and I don’t like that I have to swipe from either side to sift through options. I’d rather just tap a button to go into a clearly labeled settings menu to choose my camera mode, like I do on Samsung and LG’s camera apps. The Nexus phones were certainly the main attraction at Google's event, but I was particularly looking forward to seeing more of Now on Tap. I saw a demo at Google I/O, but seeing it work in person made me eager to see it hitting my device, along with Android Marshmallow. Now on Tap with an article from PCWorld brought up the wrong search terminology. Now on Tap works across the entire operating system, but it’s particularly impressive when you’re using it inside a simple app like the Chrome browser. I navigated to an article on virtual reality on PCWorld and held down the Home button. Now on Tap popped up with a relevant keyword and apps that I could use to delve further into the subject. The end result was limited and not entirely correct, however: The original article is about "perfecting" virtual reality, sure, but I would have rather it looked up information on the virtual reality devices that have recently made headlines. Now on Tap works is particularly impressive with choosing context for individual articles on the web. Google's demo featured an article on Donald Trump in The Atlantic. When it was activated, Now on Tap offered up links to Trump’s published works, along with The Art of War, which was mentioned in the article, and even a link to visit the USS Iowa in Los Angeles, where Trump is shown delivering a speech in an accompanying photo. That's an impressively long list of contextual information. Rather than going in and out of applications to get to the next thing you want to do, Google simply offers everything for you with the press of a button. A comparison of the last three generations of Nexus devices. I'm usually an advocate for straying away from stock Android, but I’d be willing to go back to the "pure" experience as long as it was with one of these Nexus devices in hand—preferably the more premium Nexus 6P. The Samsung Galaxy S6 Edge I'm carrying now is great, but the bloatware and TouchWiz modifications are sometimes too much to contend with. That, and I have no idea when I’ll be seeing Marshmallow—my phone’s life is actually in Verizon Wireless’s hands, not mine. I also wasn’t using Nexus devices regularly because of their abysmal camera performance, but with this new camera hardware that Google’s invested in, and the impressive indoor photos it snapped, things don’t seem as grim. These two Nexus devices will prove to be good footing for Google to revamp its efforts to sell its Nexus devices to the general public again. The Nexus 5X and 6P have convinced me to give stock Android another try.